A machine for making your own pasta. The definition of own is something that belongs to oneself. 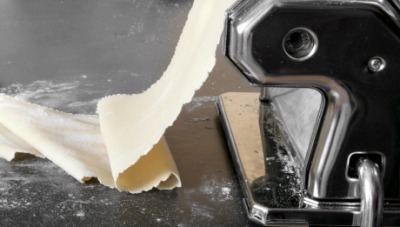 An example of own used as an adjective is the phrase is "make your own pasta," when a man makes pasta from scratch. To own is defined as to possess or acknowledge something. An example of to own is purchasing a car stereo. "own." YourDictionary, n.d. Web. 21 April 2019. <https://www.yourdictionary.com/OWN>. Middle English owene, owne from Old English āgen ; see aik- in Indo-European roots. (gaming, slang) To defeat, dominate, or be above, also spelled pwn. (computing, slang) To illicitly obtain "super-user" or "root" access into a computer system thereby having access to all of the user files on that system; pwn. From Middle English ownen, from Old English Ägnian (“to own"). Cognate with German eignen, Swedish Ã¤gna, Icelandic eiga. See also the related term owe. Surprisingly, I realised my own brother had the same idea as me. You need to find your own seat - this one is mine. He gave her a pen, because he already had his own. The restored Maxwell is Bob's own car. They went this way, but we need to find our own way. We have made some arrangements, but you will need to make your own. They were all prepared for the picnic, because they had all brought their own food and plates. implying ownership, often with emphasis. It always follows a possessive pronoun, or a noun in the possessive case. From Middle English owen, aÈen, from Old English Ägen (“own, proper, peculiar"), from Proto-Germanic *aiganaz (“own"), from Proto-Indo-European *eiá¸±- (“to have, possess"). Cognate with Scots ain (“own"), Dutch eigen (“own"), German eigen (“own"), Swedish egen (“own"), Icelandic eigin (“own"). (intransitive, UK dialectal) To confess. From Middle English unnen (“to favour, grant"), from Old English unnan (“to grant, allow, recognise, confess"), from Proto-Germanic *unnanÄ… (“to grant, thank"), from Proto-Indo-European *Än- (“to notice"). Akin to German gÃ¶nnen (from Old High German gi- + unnan), Old Norse unna (Danish unde) . In Gothic only the substantive ðŒ°ðŒ½ðƒð„ðƒ (ansts) is attested.